I was going to wait to blog about this until the dust had settled. However, I find it extremely important to expose this now. A lot of information will be withheld, until I feel it is safe to share, but let’s just say there are a couple of people who wanted a woman’s baby and are stopping at nothing to get it. They are using their money, power, and connections to try to do just that. Meet Nikki N Ben Bales. Or that’s what they’re calling themselves. I am so confused at this point I don’t know what to believe in regards to their identity. It’s possible they are Alayna and Robert Bales. Or Nikki Wallace and Ben Bales. So, Nikki N Ben decided they wanted to adopt. There was no medical reason they hadn’t conceived and never mind the fact that it isn’t really considered a fertility problem until at least a year has gone by trying to conceive, eight months was long enough for them. They wanted a baby. They wanted a baby NOW. And because of this, they began their public plea. Because I must be vague, until a later time, let’s just say that this couple finds a pregnant mom in church, they start an “adoption plan” and things move forward. This is a privately facilitated adoption with only an attorney involved. The expectant mother (Emom) has no representation of her own. Three weeks before delivery the Emom is asked to sign some legal paperwork. The paperwork, she is told, is nothing permanent and only a formality. It is a “custody arrangement.” To be clear, in the state this Emom lives, rights cannot be terminated or an adoption consented to until after the birth of a baby, and there is a ten day revocation period for that consent. I’m not aware of any state where a custody transfer can take place prior to a person being born, but I’m not a lawyer and could be wrong. So Emom signs the paper, without representation of her own, believing what she has been told because she trusts the people involved. They have only known each other for a few months but they appear to be upstanding members of the community and are religious which,she probably assumes (because I would if I were her), means they have ethics and morals. This should mean that they wouldn’t feel entitled to another woman’s baby if she doesn’t consent to that. As people of the church (oh did I mention the husband is a youth pastor?) shouldn’t they be guiding this woman to do what she feels is right and even helping her to get back on her feet regardless of whether or not there is an earthly award for their help (See: Baby = Reward for Good Deeds)? Luke 6:35 “But love your enemies, do good to them, and lend to them without expecting to get anything back. Then your reward will be great, and you will be children of the Most High, because he is kind to the ungrateful and wicked.” Matthew 6:1 “Be careful not to practice your righteousness in front of others to be seen by them. If you do, you will have no reward from your Father in heaven.” Or how about in Matthew 25? “Then the King will say to those on his right, ‘Come, you who are blessed by my Father, inherit the kingdom prepared for you from the foundation of the world. For I was hungry and you gave me food, I was thirsty and you gave me drink, I was a stranger and you welcomed me, I was naked and you clothed me, I was sick and you visited me, I was in prison and you came to me.’ Then the righteous will answer him, saying, ‘Lord, when did we see you hungry and feed you, or thirsty and give you drink? And when did we see you a stranger and welcome you, or naked and clothe you? And when did we see you sick or in prison and visit you?’ And the King will answer them, ‘Truly, I say to you, as you did it to one of the least of these my brothers, you did it to me.’” I guess Nikki N Ben Bales only clothe the naked, visit the sick or imprisoned, welcome the stranger, or give drink to the thirsty if there’s a baby to get out of the deal. AS YOU DID TO ONE OF THE LEAST OF THESE MY BROTHERS, YOU DID TO ME. No doubt that this Emom is in a dire situation, otherwise she wouldn’t have contemplated giving up her unborn child. So, may I ask to Nikki and Ben Bales, what have you done for her? And, in turn, what is it that you have done to God? The Emom delivered her baby a few days ago. And immediately changed her mind. She did not wish to go through with an adoption. No matter what she had thought or felt before, she was sure that she had changed her mind. 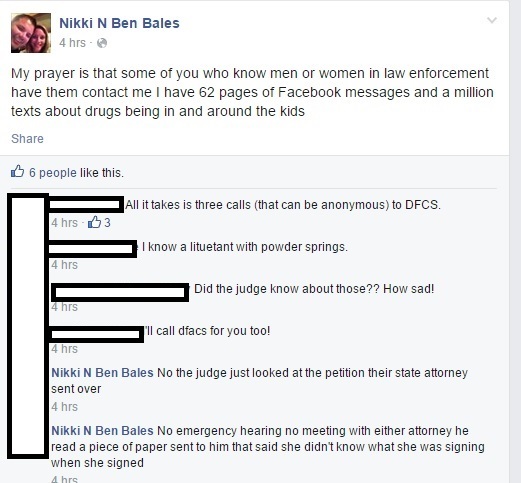 She contacted the attorney for Nikki and Ben Bales and told her so. The gist of what that attorney told her was, “Sorry, too late, nothing you can do.” Which, may I point out, was an absolute lie. Needless to say it was rendered null and void the next day with help from SOS. You would think this is where the story ends. But it isn’t. Nikki N Ben Bales have continued to harass this Emom the whole time she was in the hospital. I’m told that they had to be told, by security, to leave the grounds several times because they kept trying to get back up to the Emom’s room. Why? If she had changed her mind then why would you feel the need to see her? Maybe to “talk her into” (read: COERCION) giving you the baby? Make her feel guilty hoping she will change her mind? Or how about to threaten her? So I’m not up close and personal with this Emom, but I have seen the screen shots that Nikki N Ben Bales have posted of their supposed “proof of drug use.” It’s pretty comical to say the least. The text messages filled with threats to have all of her children removed to the Emom herself are similar to this public Facebook post. But I have to ask, since they are so very christian, since the Emom has two other children, where was your concern for their well-being during the months you have known her? Where was your battle cry to “save” her other kids if you thought she was on drugs? So it’s only when you find out that you aren’t getting the selfish desire of your heart, another woman’s baby, that you claim she is unfit? An just what makes you think you are better than her and why does it even matter? Are we the type of nation who takes babies from mothers, unwillingly, to dole them out to those more “deserving” or to those who would parent “better?” All of this is a moot point and doesn’t matter. It’s not your baby, never was. You have no right to that baby and, quite frankly, calling DCFS isn’t going to give you any rights. The family members will have first dibs. 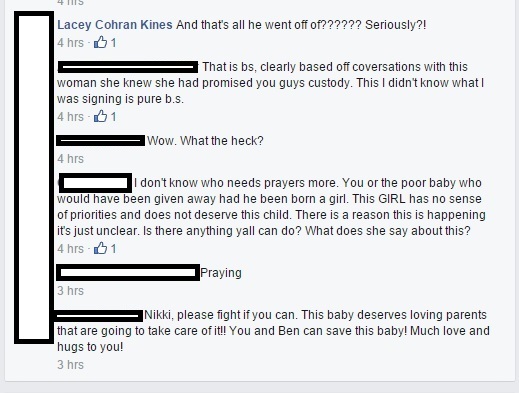 These people are actually praying that Nikki N Ben Bales will be able to take her child from her, involuntarily. They aren’t praying for this mom to get the help and support she needs to successfully parent. They are praying for a loss to this mother, to her other children, and to the baby itself. How disgusting is that? This is all smoke and mirrors and two supposedly grown people acting like children because they can’t have what they want. It’s coercion by ways of threats and it’s despicable. It’s not “christian” at ALL. And they will be held accountable for it. Not only by man’s law but by God’s law as well. A couple of questions I have, though. Why was this a custody transfer and not a legal adoption? Where is Nikki N Ben Bales home study? Is there a home study? I would guess, if I have to, because of the way this was handled, there is no home study and Nikki N Ben Bale aren’t even legally able to adopt at this time, hence using the custody transfer loophole. It’s the same method that is used in the re-homing of kids adopted internationally and from foster care. Adoptive parents, who did complete a home study and qualify to adopt, adopt a child, decide they can’t handle it, privately find others to re-home the child to and do a custody transfer instead of another adoption….because the new people aren’t able to adopt for whatever reason. There is a REASON we have an adoption process the way it is. Also, what about this attorney. I do have her name and I think the BAR would be very interested in this case. Why was she advising on a custody transfer when it was clear they wanted to adopt? Why did she tell the Emom there was nothing that could be done? Why did this Emom not have representation of her own separate from that of the “Plantiffs?” For all intents and purposes this was to be carried out like a typical adoption. Why weren’t the appropriate and legal steps taken for that? I’m happy to report that as of right now the new mom and her baby are doing well and are both home, where they belong. EDITORS NOTE *** FYI – Someone by the name of Rhonda has commented multiple times on different posts on this blog, on my Twitter account and through my Facebook page (as well as sending a message to Claudia Corrigan D’Arcy who syndicates this blog) asking that it be removed…..even though it was not active at the moment. She is claiming these are false statements and that I should remove the screen shots. Screen shots from a public Facebook page. It’s pretty laughable. These are the facts, as I know them. My freedom of speech to report on these events is protected under the Constitution and I am given the same protection as the press. I had actually totally forgotten about this draft and my intentions to publish it until now. If any of the FACTS (not opinions) that I express are untrue I welcome Rhonda to show me otherwise and I will publish a correction. If you visit Nikki N Ben Bales Facebook page now, and view their public posts, you will see they are now trying to get the media involved. Women have every right to choose to parent after the birth. Although it may be crushing to the (former) adoptive parents she chose, that’s part of the process and they need to deal with the situation with grace and good wishes for the mother and baby. It concerns me that this mother was given paperwork to sign but no legal representation. Adoptive parents are supposed to provide that for the emom. This situation is definitely not on the up and up. No it isn’t. At all. Thankfully this mother was found through our network and is getting the help she needs. I feel the need to respond on a technical ‘slight’. They were not “adoptive parents”. They were hopeful or potential adoptive parents, nothing more. They do not become adoptive parents until the adoption is actually finalized which does not actually usually take place for up to six months (I believe, in some states) after they take the child into their home. Expressing an interest in someone’s child does not make you a parent. It may seem small and insignificant but I think this idea of parenthood being conveyed on the desperate the moment they even express an interest or get a “birth”mother to talk to them only encourages this sort of behaviour. People like Nikki and Ben need very very very VERY firm boundaries from the very first conversation or else, as shown, they will walk a hundred miles all over you. That includes communication and what we call them and ensuring that they know that they are NOT *any* child’s parent until everything is signed. Parents should always have separate legal representation. It’s ridiculous that it’s even allowed for prospective adopters to pay for a lawyer and even share a lawyer. Complete conflict of interest. You make a good point about the terminology. I did try to modify it by calling them “former” adoptive parents, but you are correct, they had not yet advanced to that stage. As I understand it, the adoptive parents always pay for the expectant mother’s lawyer. However, I believe that is supposed to be a totally separate lawyer so there is no conflict of interest. It would be weird to expect an emom to pay her own legal fees, right? Frankly, there’s a problem with PAPs hiring a lawyer for the emom too. The lawyer still works for the PAPs. The adoptive parents do pay the retainer but the attorney works for the emom and isn’t allowed to discuss any aspects of the situation whatsoever with the PAP. But I have not taken this route so I only know the stated practice, not the implementation. They aren’t always the same thing. I think having [e]mom pay her own lawyer probably *sounds* more unfair on the surface than it actually is. Having hopeful adopters paying for everything sets up a huge huge huge coercive situation and many many many birthmothers have said that they only went through the adoption because of these things. They did not want to but were too scared, too young, too uneducated to know their rights and stand up to them after they had paid for everything. 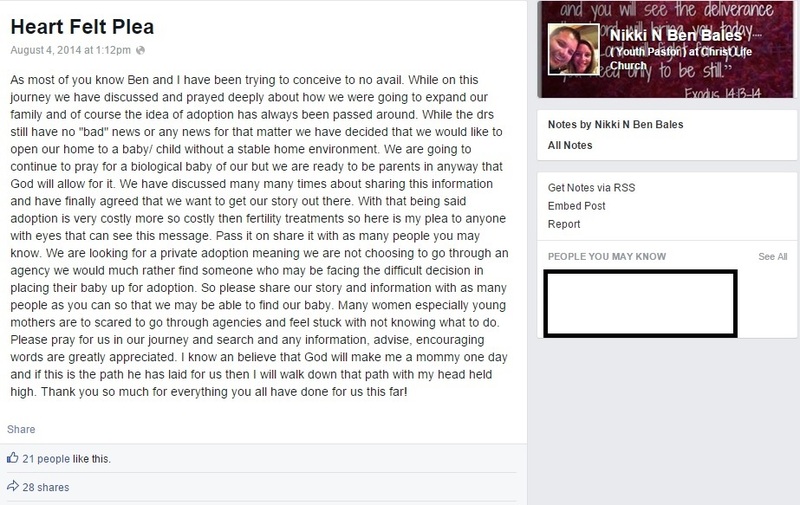 We will never get rid of people like Nikki until there is a complete separation of hopeful adopters and pregnant women like there is in Australia, a far more civilized system nowadays where neither party meets or speaks to the other and there is no money involved anywhere. 🙂 That’s why it’s not unfair. It would afford scared, confused emoms who often are isolated and have little to no support far more power and safety. Too many are taken advantage of and bullied and completely steamrolled by wealthy adopters and agencies. Thank you Cate. Pretty funny that I’m being accused of lying when they are slandering publicly on the internet. I’ll inform the appropriate parties. “I want, I want, I want!” That is what this whole tragic story is about. Nikki professes that she wants a baby that god will deliver into her arms. In actuality she tries to rip a child from a mother’s arms to claim as her own. When she doesn’t get her way she appears to lose her mind. Threats, restraining orders, public shaming. Way over the top and the typical temper tantrum we see with narcissistic rage. For what it’s worth even narcissists can claim to be Christian. Deny them something they want and see their true selves revealed.